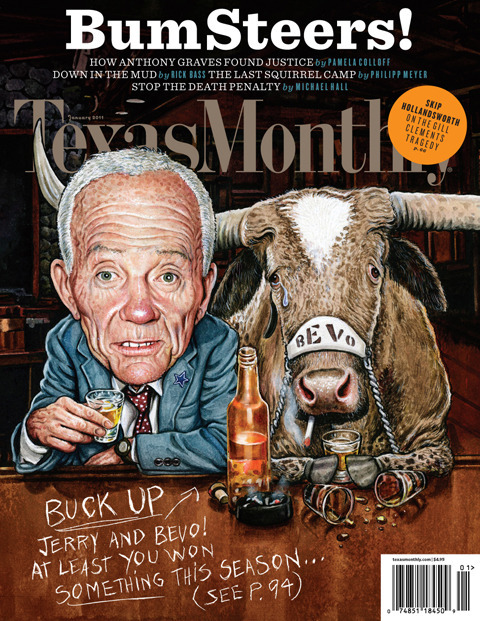 My annual dream assignment, the Texas Monthly Bum Steer Awards, has been loosed upon the world. Me and the crack team at TM (though, to be fair, not all of them are on crack) started work in earnest on this in September, and I think it’s the FUNNIEST. BUM. STEERS. EVAR. The illustrations by Lou Brooks are fantastic, and the brilliant cover is by one of my heroes, Drew Friedman. Absolutely thrilling to be associated with his work. You want. Go buy. And be sure to read the lead editorial by my friend Mike Hall. He convincingly argues for a halt of Texas’s death penalty until the law can be overhauled to prevent the kinds of miscarriages of justice we’ve seen all too frequently in the Great State (such as the one that drew nationwide attention in this recent TM piece by Pamela Colloff). Mike has spent a good part of his career calling attention to the plight of wrongly convicted or otherwise railroaded criminal defendants. But he’s no bleeding heart—no one is quicker to call out the true flaws and misdeeds of his subjects. His excellent piece is all the more powerful and persuasive because of it.